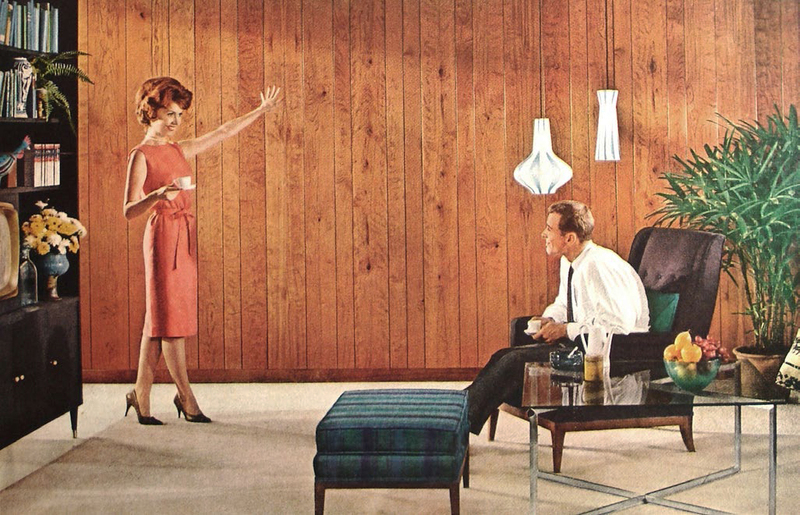 One of the prominent plywood paneling brands of the mid-century was Weldwood. This scene, part of a 1961 Weldwood ad, shows what a weekend DIY project can do to a room. Rich, dark paneling in the Wilkinson House of Orinda, by Bay Area modernist Roger Lee. 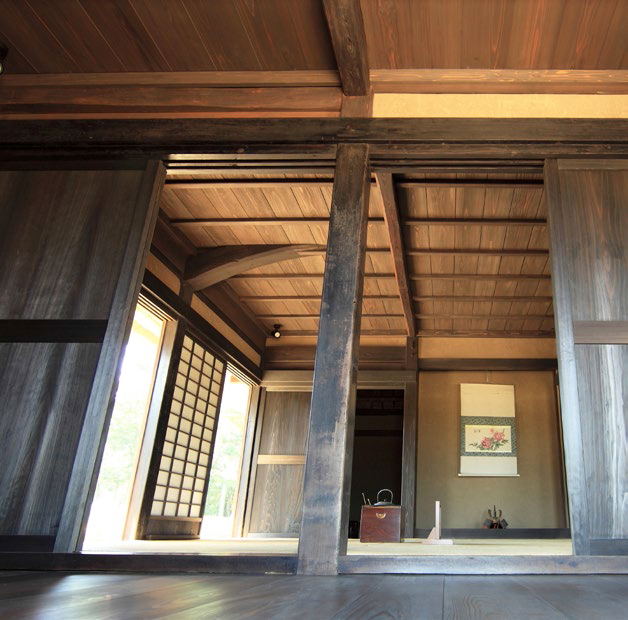 Japan's wooden houses of yesteryear influenced Eichler architects, and their walls had an ambience similar to original Eichler interiors. "Plywood's future has begun," the architectural journal Pencil Points announced in 1944, reporting on a talk by Lawrence Ottinger, president of US Plywood Corp. Ottinger predicted we would soon see "plywood bathtubs; one-piece, feather-light molded automobile bodies…indestructible furniture, and factory-built homes with movable walls." Among architects pushing for innovative uses of plywood were Eichler's teams Anshen and Allen and Jones & Emmons, both of whom showed their work in 1955 at the Golden Jubilee meeting of the Western Plywood Industry. Anshen and Allen designed a barrel-vaulted ceiling of plywood, and plywood chandeliers that would blend better than aluminum fixtures in rooms with plywood walls. 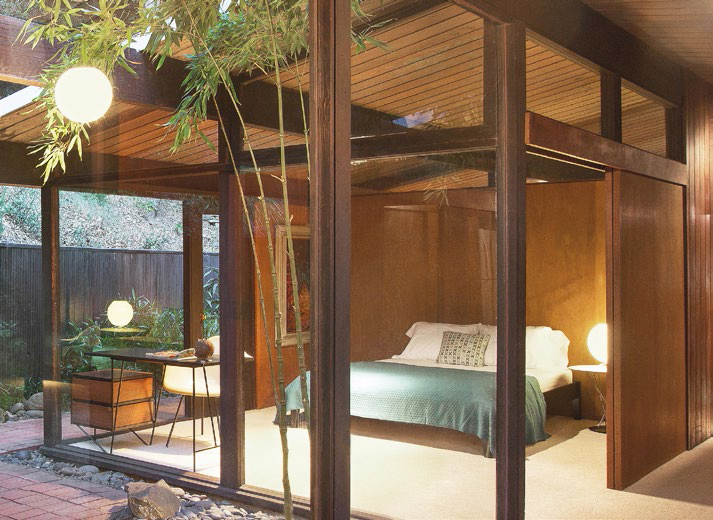 Eichler's plywood facing of choice, Philippine mahogany, has a history all its own, starting with a question: Was Philippine mahogany really mahogany at all? The Mahogany Association, which represented American producers and dealers, said no. 'Mahogany Group Sounds Warning,' a 1955 headline blared in the New York Times, with the story mentioning "cases of misrepresentation" by sellers of mahogany "substitutes," primarily "a group of Philippine hardwoods sold as 'Philippine mahogany.'" The battle goes back to the 1920s, with a federal appeals court deciding that using the term 'Philippine mahogany' is okay, even though "there is evidence to support the finding of the [Federal Trade] Commission that the lauan and tanguile sold by respondent as Philippine mahogany is the product of the tree family scientifically known as Dipterocarpaceæ, which tree family is not scientifically or botanically related to the tree family Meliaceæ, the product of which constitutes true mahogany." In drawing its conclusion, though, the court noted, "The purchasing public knows little, and cares less, I think, about the botanical characteristics of mahogany." Still, you can't blame the true mahogany interests for being snooty. Their wood, timber from the imposing tropical mahogany tree, which George Lamb in his 1946 The Mahogany Book called "the King of the Forest," has long been revered by woodworkers for its 'figured' grain. Some of the grandest cabinetmakers of the 18th century—Chippendale, Hepplewhite, and Sheraton—chose mahogany for its beauty. "The rich beauty of the wood produces an atmosphere of simplicity and dignity that reflects true refinement of taste," Lamb bragged, noting that mahogany, whether used as timber or plywood, grows more beautiful as it ages. Like 'real' mahogany, the Philippine variant also ages nicely—and has impressive historical roots, the New York Times wrote in 1961 in an article about its "beauty and durability." The "reddish, fine-grained" Philippine wood, it wrote, was "the timber that the Spanish galleons were made of."